NEW YORK -- Mike Mussina's professional career got off to a tough start. The Stanford product was all set for his first bus trip with Double-A Hagerstown in the summer of 1990, fresh off being selected 20th overall in the Draft. "I got my luggage run over by the bus," he said. "So that's how it started for me." Nineteen years later, Mussina can laugh about his introduction to Minor League baseball as he reflected on his career. 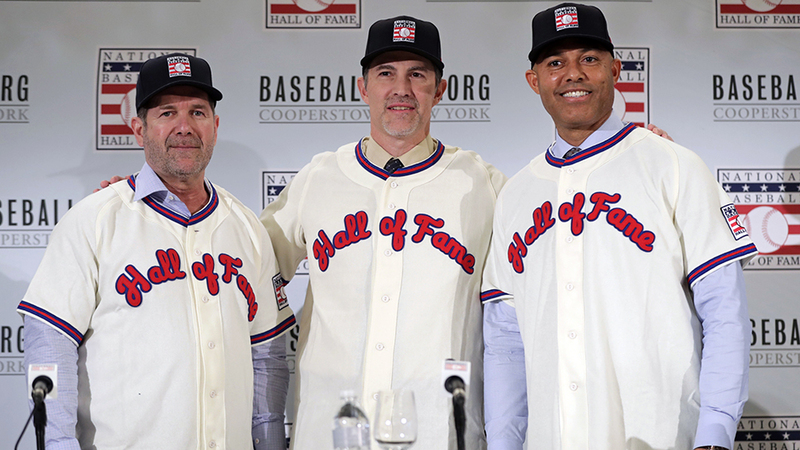 He was joined by Mariano Rivera and Edgar Martinez on Wednesday, a day after they were elected to the Baseball Hall of Fame along with Roy Halladay, whose family was in attendance. Mussina quickly advanced to Triple-A Rochester in his first professional season, helping the Red Wings capture the Governors' Cup. The following year, the right-hander went 10-4 with a 2.87 ERA, 107 strikeouts and 31 walks over 122 1/3 innings in the International League before getting a quick call to the Majors on Aug. 4. While his time on back fields and buses was brief, the Minors had a big impact on his career. "My Minor League career was interesting, I would say. I was only there for a year," the former Orioles and Yankees pitcher said. "You try to learn whatever you can, let some of the older guys help you, and that's all I tried to do. I got lucky and got an opportunity at a young age and when they gave me a chance, I did OK and I got to stay in the big leagues. That's pretty much how it happened." For Rivera, Martinez and Halladay, getting to The Show -- and staying there -- proved to be more challenging. "Coming from Panama, I didn't know no English and I remember being in Greensboro, North Carolina, my second year as a professional, and I used to go to bed -- a few days, I was crying," he said. "Not because of the game. The game to me was easier than I expected. But just the language factor. That was tough for me with the communication." Rivera put the tearful nights aside when he was on the mound. After transitioning from a position player to a reliever to a starting pitcher, the eventual closer was relegated to the bench. While working on his slider, he damaged the UCL in his right elbow. Even though the Yankees decided against Tommy John surgery, Rivera missed all of the 1992 season and was limited to 43 1/3 innings in 1993. He returned as a strong starter, climbing three levels in one season. After starting the 1995 campaign with Triple-A Columbus, Rivera made his Major League debut -- as a starter -- on May 23. The Yankees moved him to the bullpen for good the following year as he went on to convert a record 652 saves. "Minor Leagues shaped me in a way that after I learned the language, the game was a little bit easier," he said. As a kid from Puerto Rico, Martinez echoed Rivera's sentiments. The third baseman reflected on finding success every other season as he made stops at Class A Short Season Bellingham, Class A Wausau, Double-A Chattanooga and Triple-A Calgary from 1983-86. When Martinez finally got to Seattle, he had trouble sticking, bouncing between the Pacific Coast League and the American League from 1987-89. The eventual designated hitter said he thinks Jim Presley manning third base at the Kingdome and his own issues with consistency is what kept him in the Minors. "The good thing about the Minor Leagues is you got the skills, you got the ability, but in the Minor Leagues, you have good coaches that teach you to play the game right, teach you all the fundamentals that maybe as a young player in Puerto Rico I didn't learn," he said. "So the Minor Leagues is very important. It was the key to my success." Halladay, a first-rounder like Mussina, climbed through the Minors in four seasons, going 36-30 with a 3.72 ERA, 322 strikeouts and 179 walks over 493 2/3 innings before making his big league debut for the Blue Jays on Sept. 20, 1998. But after spending all of 1999 with Toronto, he was sent back to the Minors for half of 2000; a year later, it was back to the drawing board. The Jays sent their promising right-hander to Class A Advanced Dunedin to work on his delivery. While all this was happening, Halladay was starting a family with his wife, Brandy. His first son, Braden, was born in August 2000. The Colorado native worked his way back to Toronto, where he remained until he was traded to Philadelphia in 2010. Halladay became of the best pitchers of his time, winning two Cy Young awards, recording a perfect game and a postseason no-hitter. Four years after his retirement, the eight-time All-Star was killed in a plane crash on Nov. 7, 2017. He was 40. "He struggled a lot and there was a lot of pressure on kids who -- and he was just the same age that my son [Braden] is now when he started his career. It's a huge world and it's a huge responsibility and obligation and you're trying to learn things you've never done before, you're trying to learn how to do laundry," Brandy Halladay recalled. "For him, he felt so, I don't even know the right word. There was so much pressure on himself. Not from other people, but on himself to do a good job and to be the best. And it's hard. You can't always be the best." Whether it was Halladay returning to Dunedin, Martinez establishing consistency in Calgary, Rivera finding his niche in Columbus or Mussina fine-tuning in Rochester, the Minor Leagues played a pivotal part in turning former prospects into Hall of Famers. "I did a lot of almost things, I think, people would say," Mussina said. "I had a couple shots at no-hitters, a perfect game. I won almost 20 a couple other seasons. I almost won the World Series. I almost didn't make it to the Hall of Fame. But I did. "Yeah, that's my almost story. I can live with the other almosts because I get to sit up here now."